Has the Union ministry of environment and forests laid malicious siege to Dahanu taluka, in Maharashtra's Thane district? C S Dharmadhikari, retired justice of Bombay high court and chairperson of Dahanu Taluka Environment Protection Authority finds the ministry's moves reactionary: "A Supreme Court order is binding upon everyone and there can be no reconsideration on fgd ...Rajagopalan has no authority or jurisdiction to give opinion contrary to the court. And if anyone advises otherwise, then it is contempt of the court (see interview: I will see to it...)." But let's backtrack Located in the northernmost part of the west coast of Maharashtra, more than half of Dahanu is forested. The eastern part of this 960 square kilometre taluka, called jungepatti, is hilly and tribal-dominated; the western half is known as bandarpatti and comprises a low-lying coastal zone with orchards and other agricultural land. It is the latter that has made Dahanu synonymous with Sapota (Chicku). Once, the area's daily supply of this fruit was 400 tonnes; this has now fallen to 40 tonnes, and locals blame dtps (see box: what people feel). In 1991, moef notified Dahanu as an ecologically fragile area, so imposing restrictions on setting up industries that could adversely affect its environment. Such a designation also allows no change in land-use pattern. The 1991 notification had a clause directing that "a buffer zone of 25 km should be kept free of industries around the periphery of Dahanu Taluka for which provision may be made in the Master Plan", which moef removed by a 1999 amendment: this set the tenor for the ministry's future moves. But by 1991 But by 1991, Dahanu had already hit national headlines. In the mid-1980s a proposal by the Bombay Suburban Electric Supply Ltd (bses) to set up dtps raised a storm in this tribal belt. Locals feared that pollution from coal-burning would wipe out the area's horticulture as well as its green belt. After much protest, the plant got the go-ahead. But in precautionary fashion. In July 21, 1988, while giving the clearance, the environment department of the Maharashtra government spelt out 15 clauses dtps had to ensure in the future. One mandatory clause was that the bses would make an effort to obtain natural gas; if available, it had to prefer this fuel above coal. Another was that " bses will install flue gas desulphurisation (fgd) plant with 90 per cent efficiency". fgd is a pollution control device in which waste gases are scrubbed with a chemical absorbent such as limestone to remove sulphur dioxide (so2). This very clause was stressed by moef when it issued a consent letter to dtps on March 29, 1989: "Flue gas desulphurisation plant with 90 per cent efficiency must be provided in view of the good horticultural/agricultural potential of the area"; further, "no further expansion of the plant at the site will be permitted". But dtps has been functioning for the last nine years without the fgd. And now the plant's new owner, Reliance Energy Limited -- they took over from bses early this year -- wishes to delay installation further. As dtps got the go-ahead, Mumbai-based Bombay Environment Action Group and Dahanu-based Dahanu Taluka Environment Welfare Agency (dtewa) approached the Bombay high court challenging the permission. Both bses and the government assured Dahanu would be protected. 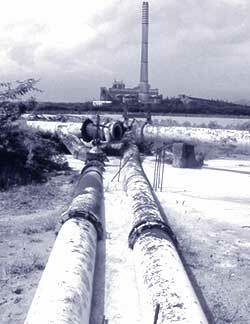 Then in 1993, even before the plant began to function, bses approached the moef. They wanted the fgd conditionality waived. This exemption was not granted; in any case, to ensure the conditionality had to be met, dtewa filed a comprehensive petition in the Supreme Court (sc) in 1994 . The report led sc to set up the Dahanu Taluka Environment Protection Authority (dtepa) in 1996, which three years later passed an order directing bses to set up the fgd plant. But in August 2000, bses approached the Bombay High Court, for a stay on the dtepa order. The court dismissed bses' petition. Once more, bses approached the sc. The latter rejected its plea and in November 2000 ordered the plant be installed. It's been over four years since the sc directive. But the fgd plant is yet to come up. bses has simply used delay tactics (see box: The due process of delay). And two events have further complicated the scenario at Dahanu. The first is the committees moef has set up. Locals, for instance, have strongly protested about the way in which the expert committee chaired by H Y Mohan Ram on Ecologically Sensitive Areas has gone about its job. According to Kerban Anklesaria, advocate for dtewa, "The committee visited Dahanu on August 22 and 23, 2003 for a public hearing, but gave only 48 hours notice to me, which was insufficient to inform all the concerned farmers and fisherfolk. Because of this, we could not make a written submission. I, along with some farmers, visited Mohan Ram at his residence in New Delhi in July 2004 and asked him to relook into the matter, but response was not forthcoming." The other is Reliance Energy Limited's (rel) takeover of dtps. This happened in January 2004. Now, rel has now submitted an action plan to dtepa asking for time till 2007 to set up fgd. Moreover, it disagrees with 'allegations' about pollution. "No scientific evidence of any kind is available to verify the claim about falling C hicku yields being in any way connected with the presence of the thermal power station," says the company's position paper on Dahanu and Chicku cultivation. On the issue of discharging hot water into the creek and disturbing aquatic life, rel's position paper says: "The study conducted by neeri on aquatic life shows that the slightly elevated temperature is in fact beneficial to marine life." Experts like Mohan Bari, former chief scientist at Kosbad Hill-based Krishi Vigyan Kendra, agree with rel. In his 2003 report, Environmental Study on Declination of Chicku Fruit Production in Coastal Parts of Thane and Navasari Districts, Bari writes: "The problem of declination of Chicku production is not only confined to Dahanu... The same problem is being noticed in other talukas of Thane and Gujarat." He claims the decline is directly linked with falling groundwater table and borewell use. Also, groundwater here has harmful salts like calcium, magnesium and chlorine, which affect the nutrient absorption by plants. rel is also questioning the need for fgd . "The 1996 report of neeri directing us to install fgd is not comprehensive. Rather...using fgd might increase problems of solid hazardous waste management. Even the Rajagopalan committee has mentioned that there is no need to have fgd, even on precautionary principle. dtps has the tallest chimney in the country to ensure there is least impact on the surrounding areas," says an official spokesperson of rel in Mumbai. He claims that local people want to denotify Dahanu so that industries can be set up and employment generated for tribal people. But S R Asolekar, associate professor, Centre for Environmental Science and Engineering, iit Mumbai, and a member of dtepa, is confident that fgd is required. During the second meeting of the moef's committee to examine the need of fgd in thermal power plants under Indian conditions --the Rajagopalan committee -- held on September 25, 2003, he stressed on the scientific need for fgd: "the model Breeze iscst 3 [a model to predict sulphur concentration] generally under predicts so2 concentration by a factor of 2 to 3.... in a situation in which so2 concentration is predicted to be >18 micro gramme per normal metre cube (g/Nm 3) on consecutive days by using iscst3 model, the chances of exceeding the concentration of 30 g/Nm 3 cannot be ruled out. Hence, on precautionary principle, fgd is required. Today, dtps' future is tagged to what the Rajagopalan and H Y Mohan Ram committees recommend. And that of Dahanu. Dharmadhikari is confident of protecting Dahanu. For instance, in March 2004, the Maharashtra Pollution Control Board (mpcb) gave rel a five-year consent to operate the plant . This was revoked by dtepa, the consent cut short to a year. In a strongly-worded letter to the board, Dharmadhikari wrote: "No other authority, board or committee or even Central or State governments can interfere with the November 2002 sc ]order or act contrary to it. Therefore, the company is initially granted permission to operate the plant till 30th April, 2005." There are chances that mpcb will not be allowed to permit dtps to operate in future. But then: Mumbai city runs on power supplied by the dtps. Any decision to shut down the plant would grind India's financial capital to a halt.